In the past few weeks, while doing my holiday shopping online, I’ve come across several well-priced jumpsuits. These jumpsuits are not your airplane mechanic’s jumpsuits, nor the one-piece garments you might have seen Devo wearing on MTV in the '80s. Hardly! This season’s jumpsuits are soft, feminine garments designed for women of all ages. Black jumpsuits with feminine accents, like the lace in the Topshop Glitter Lace Jumpsuit ($96) above, are perfect for evenings out on the town. Do you have an outfit picked out for New Year’s Eve? How about a jumpsuit? There's something very appealing about the idea of slipping into a comfortable one-piece garment for the last party of the holiday season. All you need is a statement necklace (I love gold jewelry with black jumpsuits) and party shoes and you’re ready to toast the end of 2013 and the beginning of 2014. 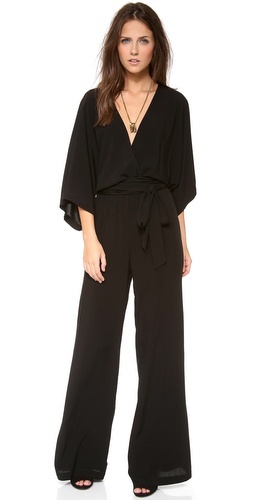 If you’re one of those lucky over 50 gals who still has good-looking arms, there are lots sleeveless jumpsuits, like this Norma Kamali Kamali Kulture Sleeveless Jumpsuit ($99). When you consider that the jumpsuit includes a top and bottom, that's a great price for a party outfit. 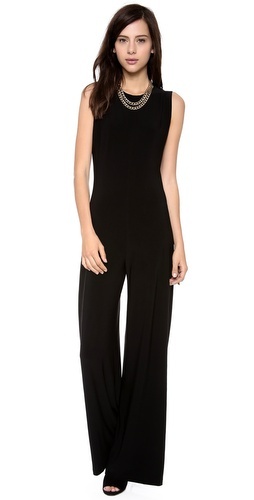 Fortunately, there are also some dressy jumpsuits with sleeves, too, like this next d.Ra Amalfi Jumpsuit ($125). I'm loving this ASTR Long Sleeve Moto Jumpsuit ($89) for a more casual New Year celebration--say, toasting marshmallows and sipping champagne by a fire with someone(s) special? And I also love this Blue Life Kimono Sleeve Jumper ($191). The kimono styling is ultra feminine and comfortable. It never seems to go out of fashion.